Still looking? Try our alphabetical recipe index. All gluten free – all the time! 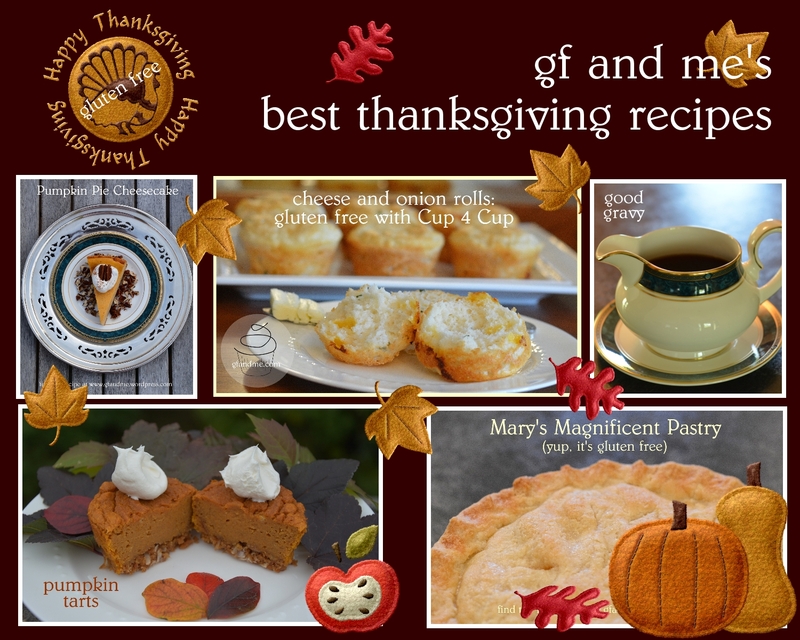 This entry was posted in Baking, Drinks & Desserts, Lunch and Dinner, Recipes and tagged bread, Cheesecake, danish, gluten free, gravy, pastry, pie, pumpkin, rolls, stuffing, tarts, thanksgiving recipes, turkey. Bookmark the permalink. looking for gluten and dairy free appetizers for Thanksgiving,,,, any ideas?? Hi Siobhan. We always consider ourselves lucky that Geoff can have dairy! It makes it much more difficult when you have to eliminate both. Some suggestions from our recipes would be coconut shrimp, pretzel chicken, chicken satay or the tortizzas without cheese. The first two have eggs in them so they may not work. Best of luck and Happy Thanksgiving!